The main objective of several studies in our lab these days is to learn more about the natural movements of bass in large waterbodies such as Lake Ontario. We are also trying to determine how well bass navigate back to their home range after displacement in local tournaments. 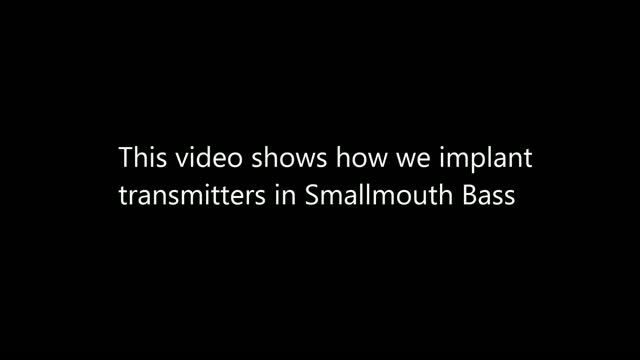 For these studies, we recently implanted a new group of fish with acoustic transmitters and thought some people might want to see how this is done. These fish were caught at the Main Ducks in Lake Ontario earlier in the day and were released just off Kingston after they recovered from the surgery. The signals from these fish will be picked up by stationary acoustic receivers that we have deployed around Lake Ontario. Periodic downloads of data from these receivers will tell us when the fish have passed by a particular receiver.